Is Dolly Parton the True Gay Republican Diva? Posted by B. Daniel Blatt at 5:36 pm - July 7, 2011. Perhaps, the Southern background (or, in Bruce’s case, residence) of many of my gay friends makes Dolly Parton appear to rank with Judy, Barbra and Ethel in our diva pantheon. And it seems nearly all (yes, I said that right, nearly all) of my gay conservative friends love Dolly. In sixteen days, she’s appearing for the first time ever at the Hollywood Bowl. And two films at Outfest (opening tonight) feature this country diva. On Saturday, July 16, you can catch Hollywood to Dollywood, a documentary about gay twins who, in an RV named Jolene, set out on a cross country trek to get their script to the buxom blond. And on Wednesday, July 13, you can singalong with Dolly (et al.) in the Best Little Whorehouse in Texas on a very big screen at the John Anson Ford Amphitheater. Posted by Bruce Carroll at 7:00 am - October 8, 2010. It speaks for itself. I’m honored that John Schwarzman, the artist, emailed me to make me aware of his work! Posted by Bruce Carroll at 12:37 pm - June 11, 2010. Hey y’all. Things are great in Nashville this week on our Country Music vacation. But you’d know that if you FOLLOW ME ON TWITTER. Couple of quick notes – the CMA MusicFest will air (edited) on ABC on Sept. 1st. And I’m keeping the photos I take this week up to date at my FLICKR site. Here’s one from this morning’s Josh Turner fan club party. Posted by Bruce Carroll at 5:16 pm - June 9, 2010. Hey all. 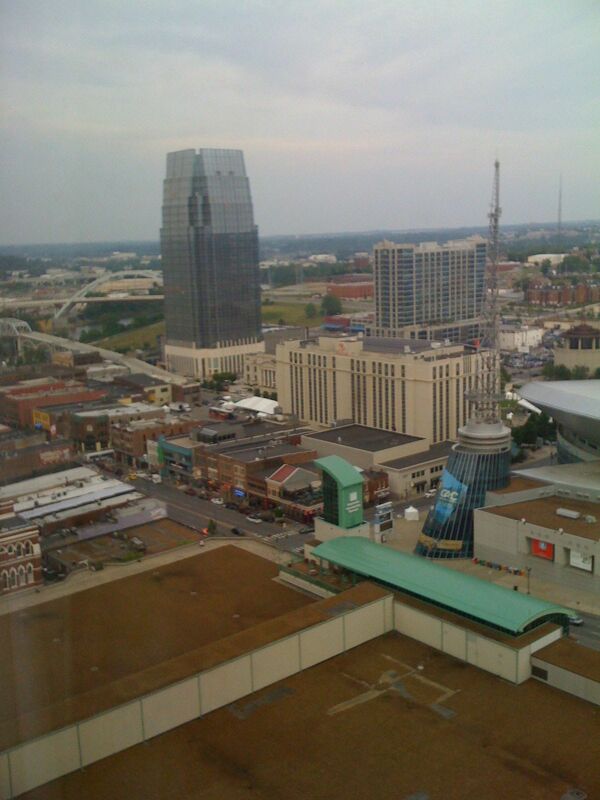 We are only a couple hours away from the CMT Music Awards here in Nashville. 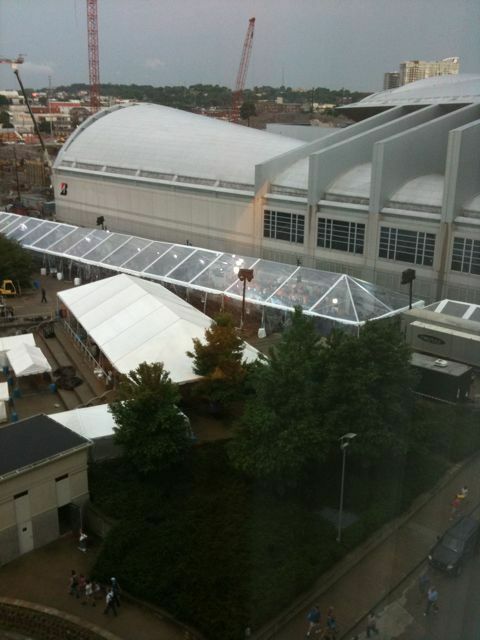 It is hard to see, but the attached photo is the “Blue Carpet” where Country Music’s stars are entering the Bridgestone Arena. Last night’s Grand Ole Opry show was phenomenal. 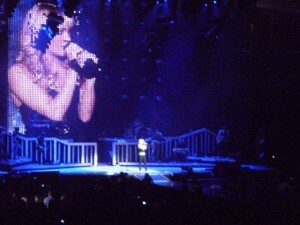 Carrie Underwood’s voice gave me goosebumps. Especially when she bridged “Jesus, Take The Wheel” into “How Great Thou Art.” Whoa! Trisha Yearwood & Josh Turner were also fan-friggin-tastic. Anyway, I’m trying to keep folks updated on the Nashville trip on Twitter. Follow Me! Posted by Bruce Carroll at 8:15 pm - June 6, 2010. 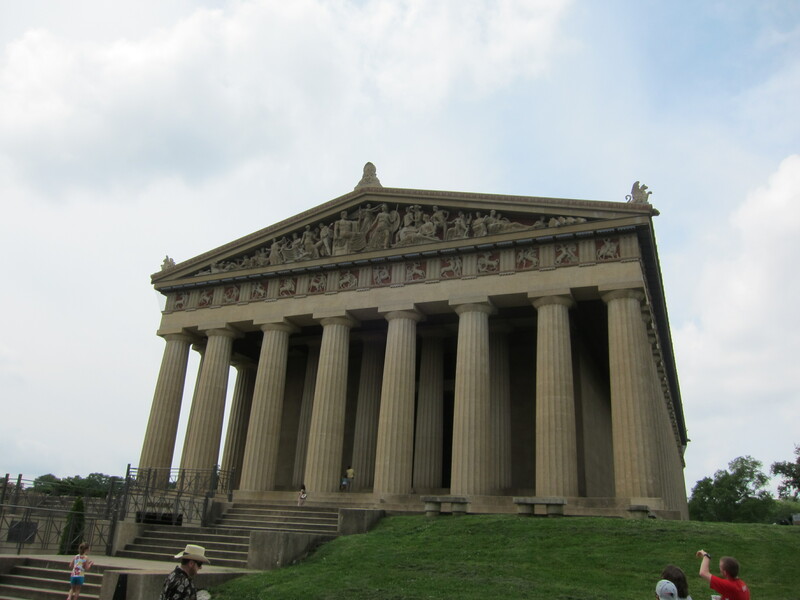 Gentle readers, PatriotPartner & I are on vacation for the next week — bound for the CMA MusicFest in Nashville, TN. We leave Monday afternoon, with a stopover in Knoxville. Who knows, maybe we’ll run into Instapundit? Anyway, my blogging will be very slow during the CMA MusicFest. I’m not bringing a computer — but will put up an occasional post from Nashville via my iPhone. However, if you really want to know how CMA MusicFest is going from our perspective — well, you should be following me on Twitter! Posted by Bruce Carroll at 2:58 pm - April 20, 2008. My apologies for a somewhat delayed posting.Â On Friday Night PatriotPartner, PatriotMom and I trekked to the Charlotte Bobcats Arena (Ooops!Â Now the TimeWarner Cable Arena!) 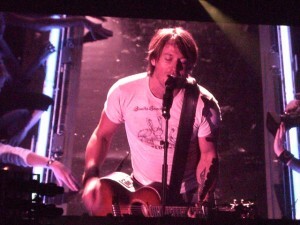 to hear two of the titans of today’s country music:Â Keith Urban & Carrie Underwood. The concert was great although Carrie’s portion was a bit weaker due to what seemed to us to be a sound-mixer not doing his/her job; Carrie’s voice was drowned out by the very LOUD band supporting her.Â It wasn’t her voice because when the slower songs came on (lower background music), that velvety voice of hers filled the Bobcats Arena.Â She also came out later to duet with Keith Urban and they both sounded great.Â I’m kinda ticked because while Partner & Mom are more Keith fans than I, I was REALLLLY looking forward to hearing Carrie.Â Â I guess there will be a next time. Here are some pics from the show.Â Â I’ll upload a couple videos later. 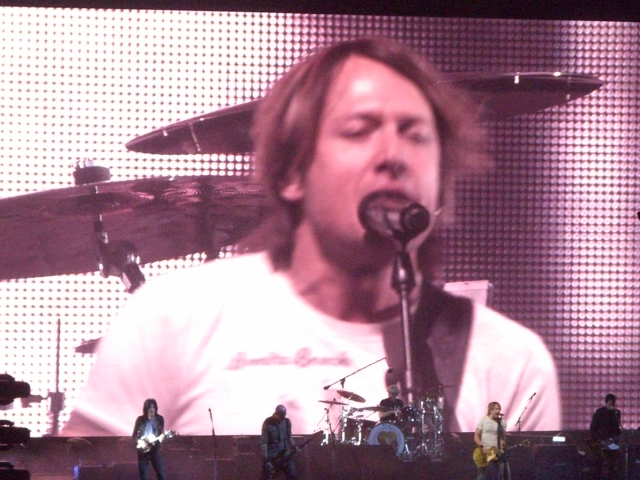 By the way, there’s nothing much to say about Keith Urban’s performance.Â He was flawless, a great performer, awesome voice, and nice T-shirt! Posted by Bruce Carroll at 11:58 am - August 25, 2007. This is somewhat of a delayed posting from our bankrupting vacation to Las Vegas in May. As many of you know, two of my favorite country music artists are Carrie Underwood and Brad Paisley. Both were honored at the Academy of Country Music Awards in Las Vegas (with Patriot Family firmly embedded in their seats) as Female and Male Vocalists of the Year, respectively. PatriotPartner and I had the pleasure of seeing Brad Paisley (plus Kellie Pickler, Taylor Swift and Jack Ingram) play in Charlotte in late July. Paisley throws an incredible concert which rivals anything I’ve seen recently from Bon Jovi to U2 to the big names in Vegas. If Brad is coming your way, go to the show! So, if George Strait is the current reigning “King of Country Music”, then surely Brad is Country’s Prince. As a bit of a departure from serious subjects, I draw your attention to this profile of Brad Paisley that was featured in today’s Charlotte Observer. Besides the humor, what sets Paisley apart from most country stars is his guitar playing. Like Keith Urban and Vince Gill, Paisley could be a lead guitarist in any country or rock band. His influences include Nashville pickers but also big names from the rock world. When writing tunes for “5th Gear,” he found himself in a reflective mood about his teen years because he was about to become a father. “It’s the closest I get to a second chance — this little boy,” the proud papa said. William Huckleberry Paisley was born in February. Dad came up with the middle name, which is what the parents are calling him. Posted by Bruce Carroll at 6:38 am - May 22, 2007. Hey everybody….. vacation is over (well, until Memorial Day weekend!) and I’m back on the road for work. This week: West Virginia & Atlanta. As the week goes along, I’ll be doing some postings (with photos) about our trip to Vegas last week and more specifically about the Academy of Country Music Awards. Cliffnotes Version: Great Trip. Expensive. ACM Awards Show was incredible! Lots of country music star sightings. So just letting everyone know I’m alive and well… and I didn’t lose my house at the Poker Tournament! Posted by Bruce Carroll at 8:22 am - May 12, 2007. Okay, so we’ve made the executive decision to leave the laptop at home and enjoy the trip, sans blogging. I promise I’ll take photos of any County Music Stars we come in contact with this week at the MGM Grand. And a full report on the Vegas trip and the Academy of Country Music Awards show when I return next weekend. Don’t forget to tune into the ACM Awards Tuesday night on CBS-TV at 8pm Eastern/Pacific. Posted by Bruce Carroll at 1:06 pm - May 9, 2007. Just a couple more work days and I’ll be Vegas-bound for the Academy of Country Music Awards vacation. Today, I continue the ACM Countdown with Top Female Vocalist. Well, I’m in love with Carrie Underwood. She has rocketed from American Idol winner to Grammy winner in just two years. She is probably the most successful Idol contestant so far (including Kelly Clarkson). But I’m torn here because I also love Martina McBride and have seen her in concert and really love her music. And, I’ve also seen Sara Evans… think she has an amazing voice… and frankly, she is smoking hot. Next Tuesday, the Academy of Country Music will decide who the Top Female Vocalist is. When it comes down to it, I think this is one of the strongest categories. All of these women are outstanding. Today, you can pick your favorite. Who Is Your Pick For Top Female Country Vocalist? Posted by Bruce Carroll at 7:05 pm - May 7, 2007. This year we decided to combine two Patriot favorite past times into one vacation. One week from tomorrow night, PatriotPartner, PatriotMom and I will be in the audience for the 42nd Annual Academy of Country Music Awards — live from the MGM Grand Garden Arena in Las Vegas! We leave this coming Saturday for a week’s vacation in Vegas including the ACM Awards on Tuesday May 15, and the “Music & Passion” Barry Manilow show at the Hilton a week from this Thursday. Hopefully there will be some time where I can post photos of the festivities during our trip. To start the countdown this week, I thought it would be fun to post a poll of the nominees to get your thoughts. Of course, we start off with Top Male Vocalist. Posted by Bruce Carroll at 11:16 pm - January 11, 2007. If you are looking for a very good alternative to American Idol or Grease: You’re The One That I Want and if you think that E.R. jumped the shark a few years ago… tune into the USA Network on Thursday nights at 10PM Eastern for NASHVILLE STAR! The 5th season of Nashville Star began tonight with ten uber-talented country music singers. Don’t get me wrong, I’m a big fan of Idol… but there is more natural singing and performing talent in the ten Nashville Star singers than most of the American Idol wannabees combined. Angela Hacker – a Mom chasing her life-long dream after working hard to support her young boy. She has a great voice and reminds me of Bonnie Raitt but with a softer and more intense emotion. David St. Romain – a fellow Louisanian! I thought David was the best male performer tonight and had the most mature singing voice, despite his baby face. Outstanding. An honorable mention for first impressions goes to Dustin Wilkes – former US Marine. Think the looks of Keith Anderson combined with Billy Currington and the heart and soul of Darrell Worley. A great first show this season. Brad Paisley — Welcome To Charlotte! Posted by Bruce Carroll at 10:37 am - June 17, 2006. For the second time this year, PatriotPartner and I will be attending the awesome Brad Paisley concert. Back in April we drove to Knoxville, but tonight Brad comes to us! Sara Evans is opening….which has me almost excited as hearing Brad again. Sara and Billy Currington opened for Brad in Knoxville. It is nice to enjoy our new hometown of Charlotte in the ways that we have. Maybe Washington, DC has more things to do…. but in Charlotte you can actually get there without sitting in traffic for an hour to go 5 miles. Welcome Brad & Sara! We will see you tonight!! Posted by Bruce Carroll at 12:19 pm - April 1, 2006. We found ourselves only about 5 rows from center stage on the floor. I have never been that close to the stage in any of my limited concert-going experiences. Brad was great and we and thousands of others wound up being part of a Country Music Association promo to air on CBS in the coming weeks. The CMA awards are on May 23rd from Las Vegas. Plus, after the “official concert”, Brad shot a video for an upcoming new single: “The World“. There were giant beach balls that looked like Planet Earth being bounced around the audience during the song. Awesome. So look for us close to center stage in any of those video clips! Also, Sara Evans did an incredible opening set for Brad. She sings so many songs that I know that it wasn’t hard to sing along to every one. She is a high energy performer, and quite a hot-looking woman I might add. She is a mom of three kids and has been married for 12 years! And the girl looks 24. Tammy Bruce would enjoy. Heh heh. The night in Knoxville started off with smoking hottie country singer Billy Currington. Let me tell you folks, Ace from American Idol could learn a helluva lot about the “smoldering” look from Billy Currington. Whoa! He also sang some great songs like “Party for Two” (a duet with Shania Twain) that he sang with the ladies in the audience, and his very smoldering new hit “Must Be Doin’ Something Right.” If Billy comes to your town…. I suggest all the guys and girls check him out. Great performance, high energy, easy on the eyes. 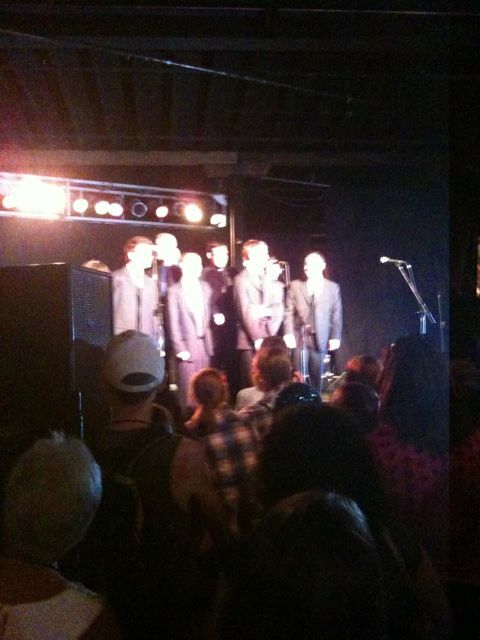 These aren’t photos from our concert, because stupid GayPatriot forgot to bring his camera…. and we would have gotten awesome photos considering how close we were! But you get the idea. Tonight, we are headed to the new Charlotte Bobcats Arena to see another one of our favorites. Martina McBride! I *will* be taking my camera… and hope to post some photos tomorrow. We are going to be going early as both of our local country stations are having tailgating parties before the show.